The PATENTED Tech Stirrup irons are entirely produced in Italy. They are made from aluminium billet and fitted with stainless blocked screws. The treads and the rings are treated with a 20 micron anodization to preserve their beauty. 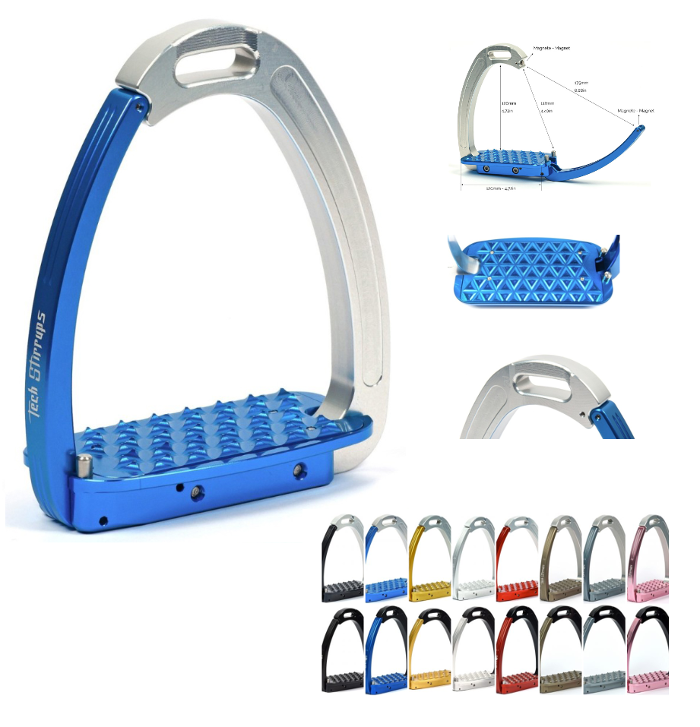 For the least possible harm to the horse and to avoid damage to the tack, the front of the tread is rounded and all the edges on the stirrups are rounded off. The smallest details have been focused on; all the milling done with high speed CNC machines and set up with CAD- CAM in order to obtain optimum finishing; even the screws have been built in so that they won’t stick out. The Tech Stirrups are produced with certificated materials and packed into recyclable carton boxes. Before packaging, all the rings are subjected to a stress test. Despite the screws are secured, we advise the customer to verify the proper closure before use. The Tech Stirrups grip is designed to avoid dirt accumulation and to be particularly efficient even when wet. Strategically placed stirrup leather eyes provide rider comfort and assist in retrieving lost stirrups. 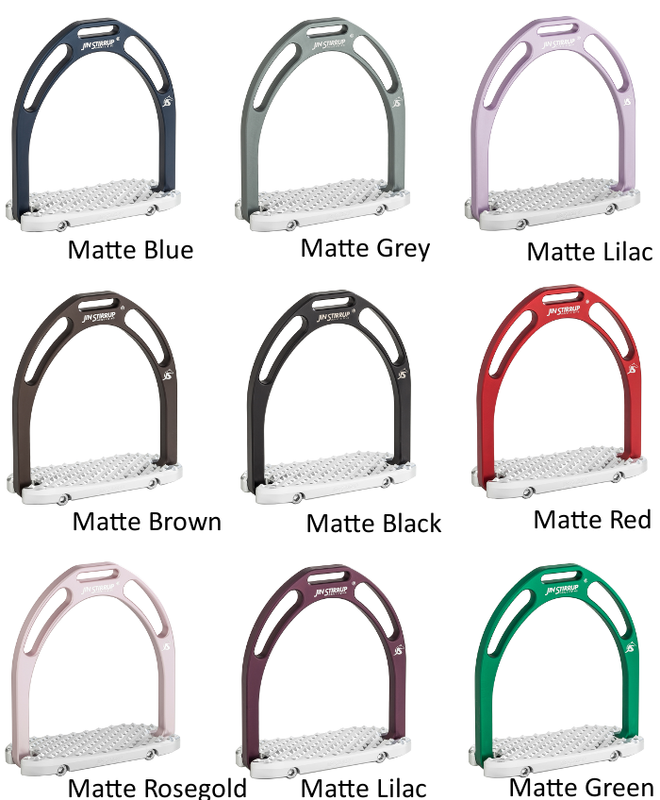 Designed for the Hunter Ring, the Diana is a more refined and understated stirrup iron without any branding; and it is available in classic colors that highlight its sophistication. The Diana features an aggressive tread that is inclined 4 degrees for better contact and grip in a more elegant, understated package. The Aphrodite features a moderate tread that is slightly beveled on both edges, which allows the rider to communicate with the horse without hinderance. The weight of the stirrup iron is also concentrated in the tread to assist proper leg positioning. The Athena features an aggressive tread that is inclined 4 degrees for better contact and grip, with cutting edge design and fun color options. Designed for Cross Country riding, the Iris features an ultra aggressive tread with drainage holes for superior grip reguardless of weather conditions. It is also inclined 4 degrees for better contact and grip, with cutting edge design details and fun color options. The “Venice” stirrups have a revolutionary mechanism that allows the opening of a ring portion and the escape of the foot; after which the mobile part automatically returns to its original position via a spring. The mobile part is hooked to the tread and joined to the ring thanks to the strength of the spring and to a special system with two magnets that does not allow it to move during work but allows it to open only if a certain weight load is exceeded. All the PATENTED Tech Stirrups are entirely produced in Italy. They are made of aeronautical aluminum billet and fitted with stainless steel blocked screws. They are treated with a 20 micron anodization to preserve the aesthetic quality. 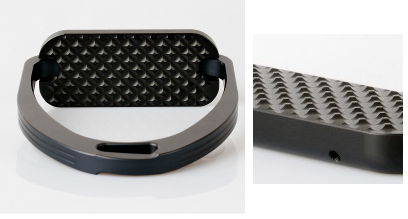 The 3° slope and the concave shape of the pad help keep the foot in the right position and improve stability. 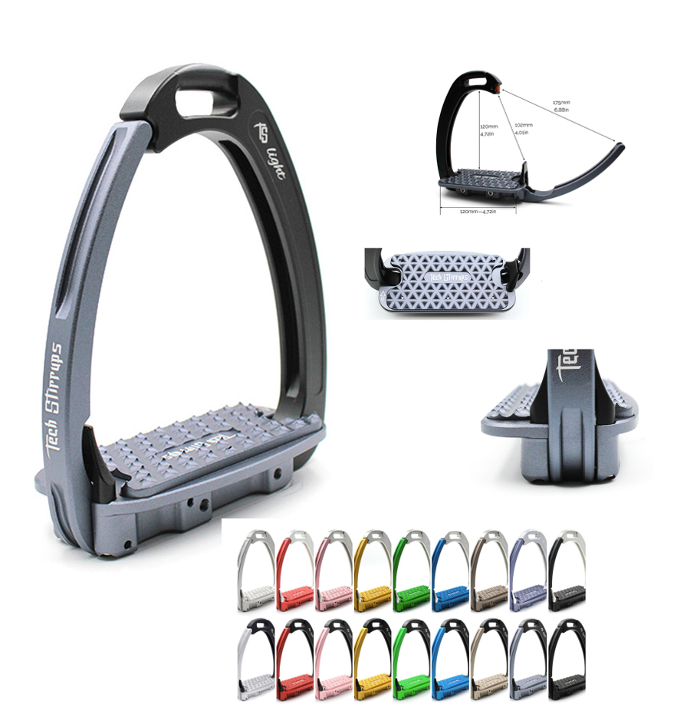 Venice light is the lightest safety stirrup available on the market. 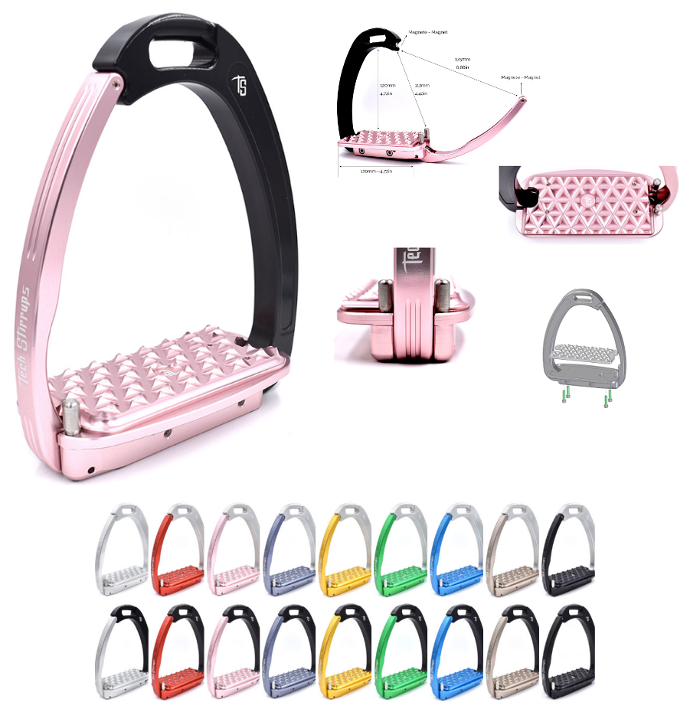 “Venice light” riding stirrups are provided with a revolutionary safety mechanism which allows a section of the stirrup to open, thus easing the release of the foot; which, thanks to a specific spring, then goes back to its original position. The spring allows the moving part to stay closed during horse riding activities and to open only when a certain pressure is applied. The locking mechanism of the moving part is cushioned by a rubber insert on the ring which allows it to be particularly reactive in case of need. All patented Tech Stirrups are 100% made in Italy. Tech Stirrups Venice Light are made from aluminium billet and then fastened with stainless steel screws. They are anodised (20μm treatment) to preserve their aesthetic quality. The shape of the stirrup leather loop itself has been conceived so to allow adjustments and effortless mounting. Our stirrups does not need special leathers. Classic stirrup leathers can be used. 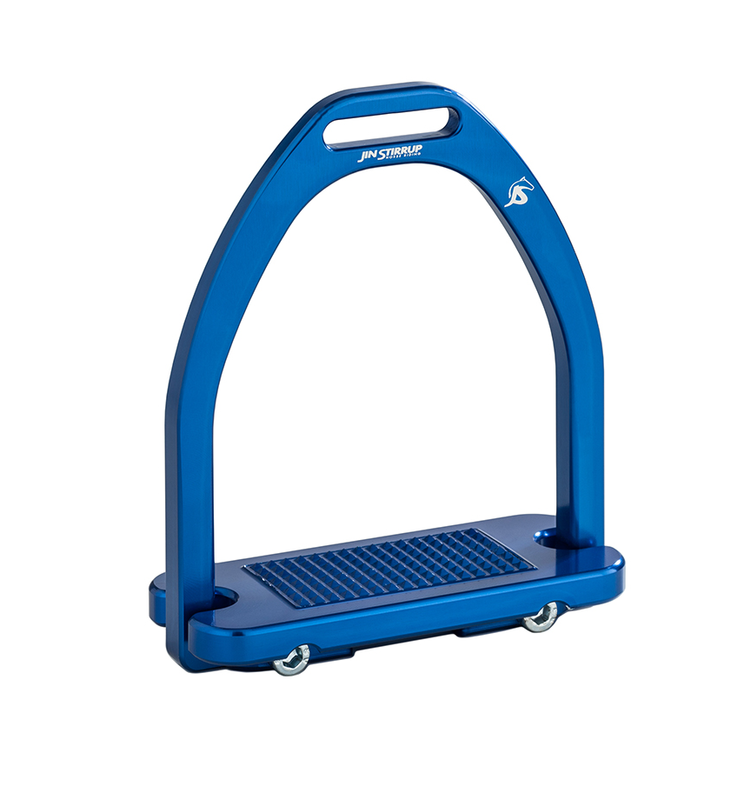 Over 25 years ago, Sprenger and the inventor Erwin Meroth developed the first jointed stirrups. 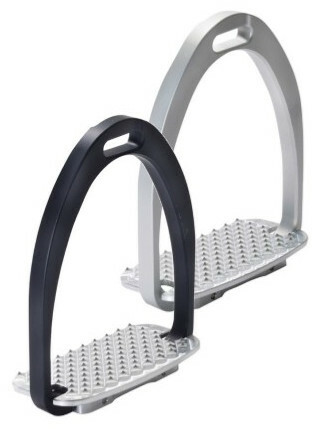 The stirrup is characterized by a forward and backward moveable tread which automatically turns the rider’s heels in the correct low position and reduces the risk of becoming stuck in the stirrup in case of an emergency. The movable tread enables permanent contact and additionally provides very good foothold and relaxed calves. This might explain its great popularity among show jumpers and military riders. Success – as in most cases – brings plagiarism. The copies you find in the market are often of poor quality and can generate a major safety risk. Therefore only trust the original from SPRENGER. Available in: 4 1/4", 4 1/2", 4 3/4"
4 1/4" 4 1/2" 4 3/4"
The bow that puts you on a winning curve. The new stirrup design ensures an improved leg position. 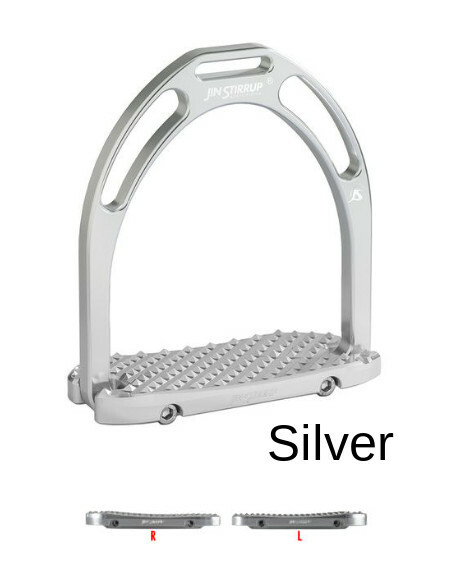 The changed weight ratio on these stirrups results in perfect balance and greater comfort for the rider. The widened tread is made out of two types of rubber properties and takes effect in shock absorbing grip. 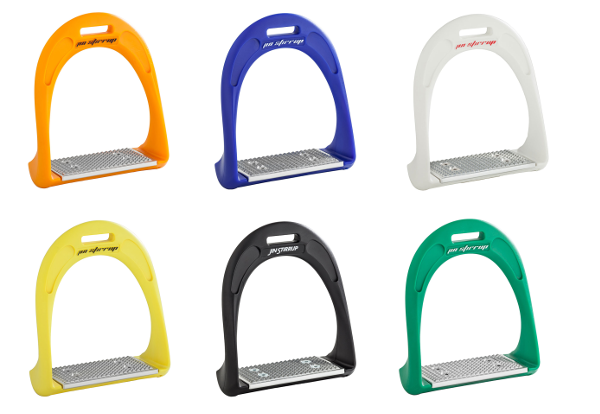 The internationally approved System 4 technology of these stirrups can support the release of the foot in case of an emergency. Flexible in 4 directions it softens the impact on the rider‘s cartilage and ligaments without creating an unstable feeling for the rider. Bow Balance design provides easy “pick up“ upon mounting as they require very little effort on the rider’s part – a simple touch of the foot to the stirrup and it gently folds onto the rider’s foot. 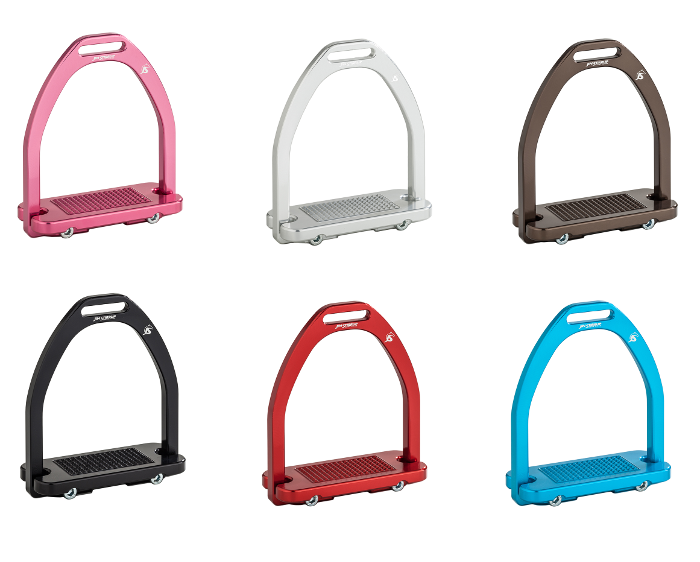 Bow Balance Stirrups – for a smart riding experience. 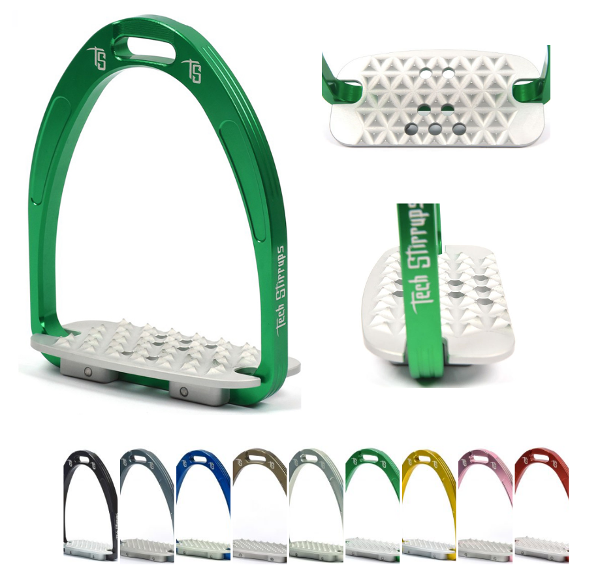 Available in 4 1/4", 4 3/4", 5 1/8"
4 1/4" 4 3/4' 5 1/8"
The brand new, patented Anatomic Stirrup by JIN is here! 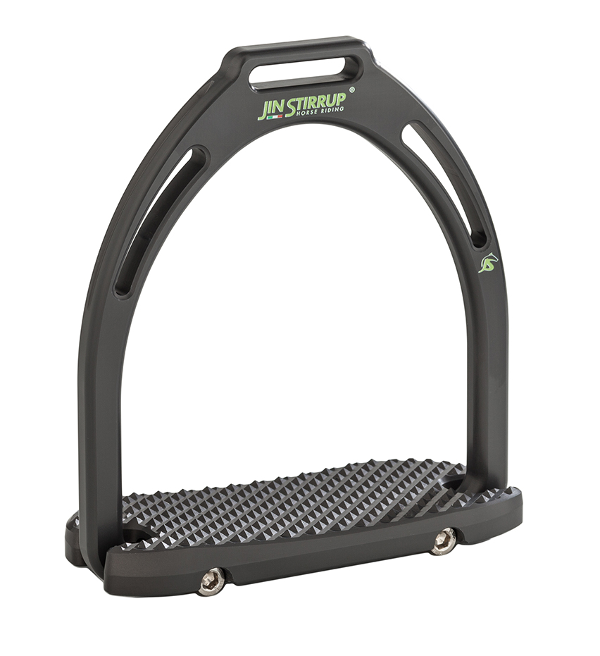 The Anatomic is the latest evolution of the JIN technical stirrup. Its patented, ergonomic foot bed provides additional stability to the the rider's foot, to aid in side-to-side pronation and to provide additional support for the ankle and knee joints. 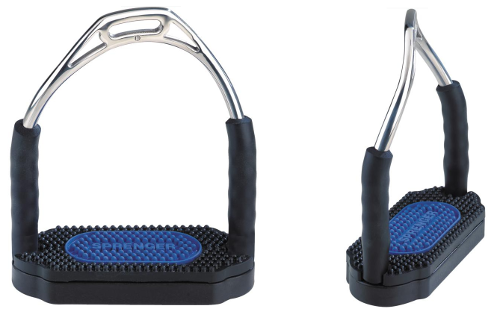 The stirrup pad, inclined at 4 degrees from back to front, ensures excellent grip and maximum stability. The wide footpad distributes the rider's weight over a greater surface area, increasing circulation to the toes, and features a wider foot bed tread and larger tread spikes. The Anatomic is available in traditional silver, as well as a full range of vibrant colours. The Shiny colour line features bold and vibrant hues that make a statement! The Matte colour line features a matte (pearly) finish for a classic and subtle look. The patented Dynamik features ergonomic foot pads, uniquely fitting the left and right foot. The exterior colour coating has been subjected to a special powder coated surface treatment, which makes it more resistant to wear and tear, guaranteeing longer duration of its valuable grip, of particular benefit to those spending many hours in the saddle. The Dynamik features a small and closely positioned tread. 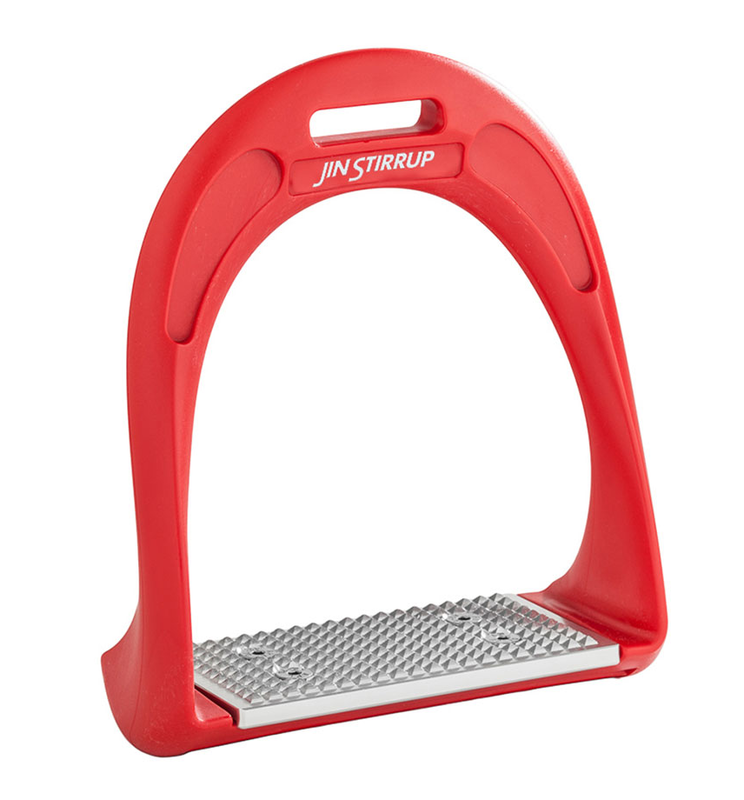 The brand new, patented Dressage Stirrup by JIN is here! 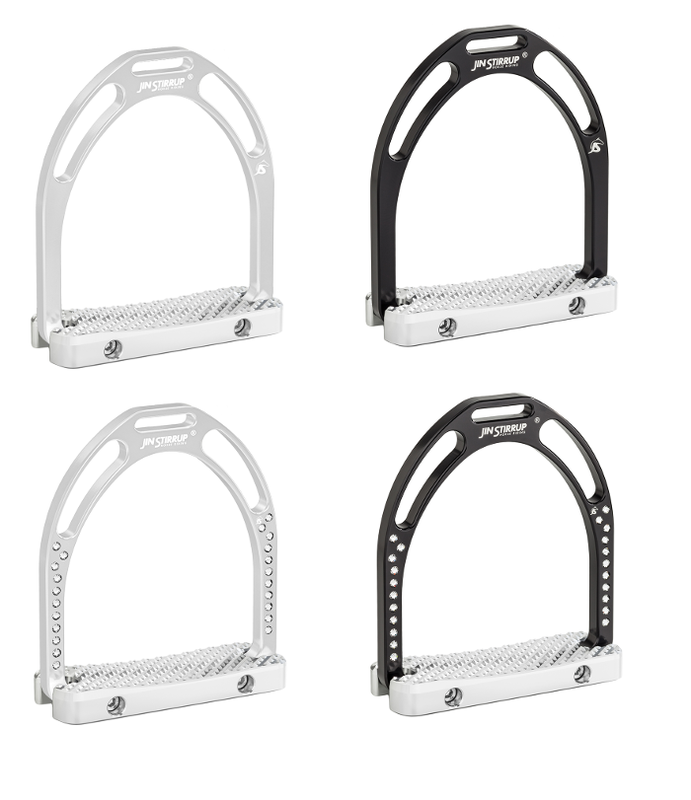 The Dressage Stirrup is a brand technical stirrup, designed specifically with the dressage rider in mind. Like the Anatomic, its patented, ergonomic foot bed provides additional stability to the outside of the rider's foot to aid in side-to-side pronation and to provide additional support for the ankle and knee joints. 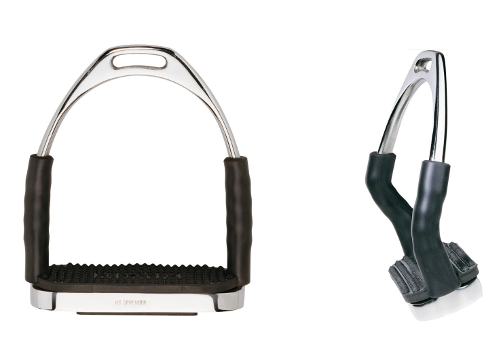 The Dressage Stirrup by JIN has a larger, thicker foot pad, resulting in more weight when compared to other JIN models. 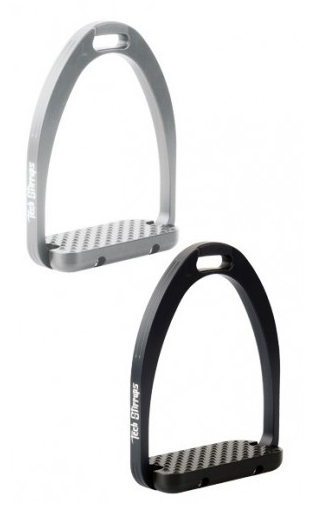 The Dressage Stirrup by JIN is available in traditional silver, black and Precious Swarovski options in each color. 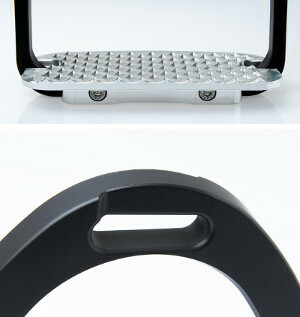 JIN Joker Stirrups are made of top quality aluminum. They are constructed to a smaller size and are therefore suitable for children. The inside foot pad measures 3 3/4" from arch to arch, and when using the general rule of thumb of being able to fit an index finger on either side of the foot when in the stirrup (so there is room for the foot to slide out), it leaves a foot width of 2 3/4" or just under 7cm. This model comes in 7 colours, all with a bright and shiny finish. Have your name, horse's name or initials is available (up to 15 characters) for $50.00 per pair (plus tax). Laser engraving is positioned on the outer edge of the stirrup, facing out. Please allow an additional 5-7 days for engraving. 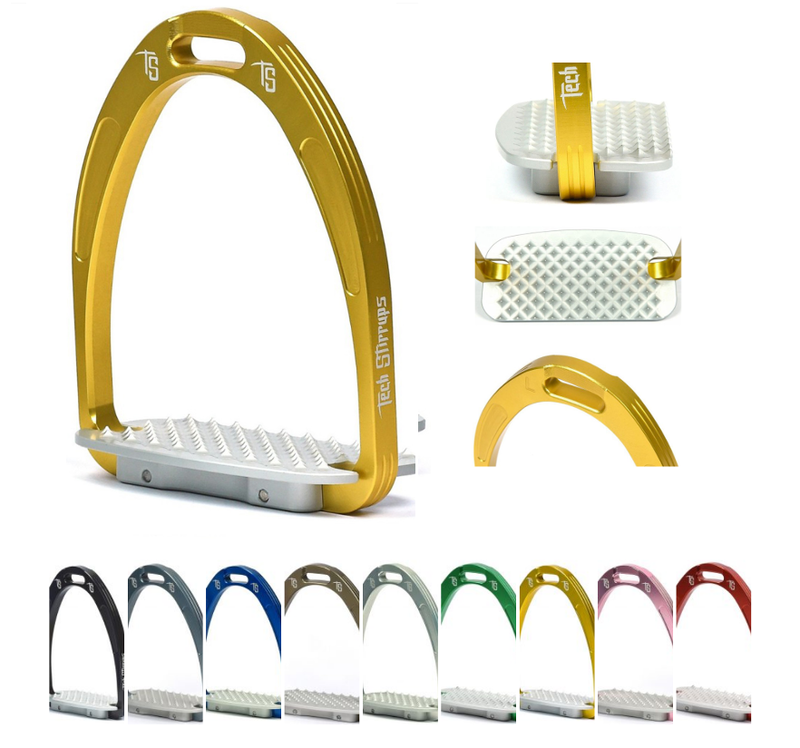 The Evol stirrups are made of plastic, with the foot pad coated in top quality aluminum. They are designed to be light and comfortable. Other Colors available by special order. Contact us.